NO BAKE BLACK FOREST CHEESECAKE — An easy no-bake cheesecake with a chocolate crumb crust, vanilla and chocolate cheesecake layers, topped with cherry pie filling. 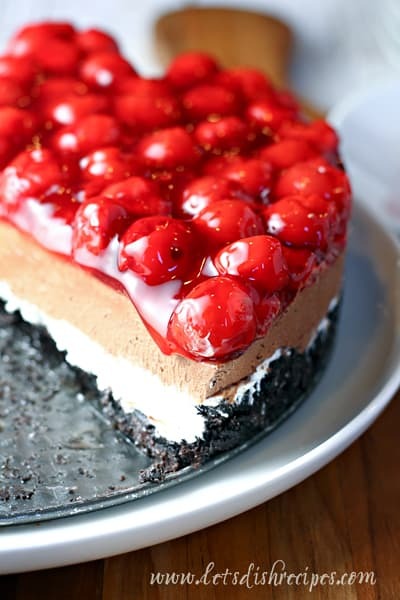 I love a good no-bake cheesecake, and let me tell you this No Bake Black Forest Cheesecake is good. Really good! And even though it looks fancy with all the separate chocolate and vanilla cheesecake layers, it’s amazingly simple and easy to put together. It all starts off with a chocolate cookie crumb crust, although you could do graham cracker too. I just think the chocolate crust is more in keeping with the black forest theme. You technically don’t even have to make two fillings for the layers. You make a basic cheesecake filling, add half to the pan, then stir some melted chocolate into the rest and you’ve got your chocolate filling. Easy peasy! 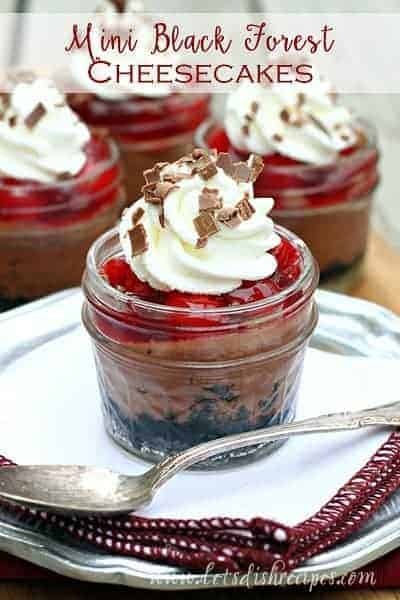 Everything gets topped off with a can of cherry pie filling and you have a decadent, no-bake dessert that looks like you spent hours in the kitchen. Of course, if you want to make things extra special, you can always make homemade cherry pie filling. No one will complain about that! My husband is something of a cheesecake connoisseur (or at least, he likes to think he is) and he’s also a big fan of black forest desserts. 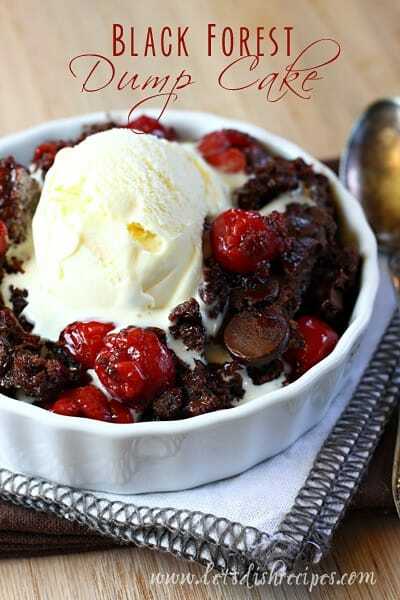 Pretty much anything that involves cherries and chocolate. So to say he loved this dessert would be a huge understatement. But let’s be honest. We all loved it. Hopefully you’ll love it too! 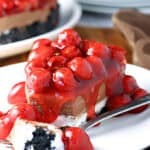 Be sure to save this No Bake Black Forest Cheesecake recipe to your favorite Pinterest board for later. To prepare the crust, combine cookie crumbs, butter and sugar in a medium bowl. Press into the bottom of a 9-inch springform pan. Refrigerate while you prepare the filling. In a separate bowl, beat the cream cheese and 1/3 cup sugar until smooth. Mix in sour cream and vanilla. Fold in the Cool Whip. Spread half of the cream cheese mixture over the prepared crust. Freeze while you prepare the chocolate layer. In a microwave safe bowl, melt the chocolate with the milk at 50% power until smooth. Cool to lukewarm. Stir the chocolate into the remaining cheesecake filling. Spread the chocolate filling over the vanilla filling. Cover and refrigerate for 4-6 hours, or until firm. Before serving, top with cherry pie filling. 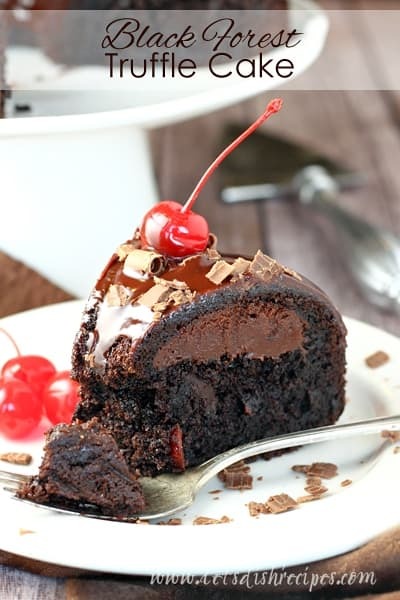 I love black forest cake, never tried a cheesecake version though. Sounds delicious!